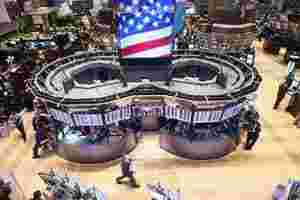 New York: Banks dragged the US stock market lower on Monday, with losses accelerating late after Bank of America’s stock price fell below $5 for the first time in nearly three years. When BofA, the largest US bank, plunged through $5, it ignited a late-day decline in the sector and the broader market, which fell 1 percent. More than 29 million shares of the stock traded, accounting for about 5.4% of the day’s total trading. The bank’s woes underscore the headwinds buffetting the financial sector on both sides of the Atlantic. Comments from Mario Draghi, president of the European Central Bank, weighed on sentiment after he said the economic outlook contained substantial downside risks, adding that 2012 would be a difficult year for banks. “If you add up all the factors facing banks, this just isn’t a good environment for financials, and since the lion’s share of the worry in the market is related to financials, a bad deal for them means a bad day for everyone," said Mike Shea, managing partner and trader at Direct Access Partners LLC in New York. BofA closed down 4% at $4.99 while JPMorgan Chase & Co fell 3.7% to $30.70 and Citigroup Inc slumped 4.6% to $24.82. The Dow Jones industrial average was down 100.13 points, or 0.84%, at 11,766.26. The Standard & Poor’s 500 Index was down 14.31 points, or 1.17%, at 1,205.35. The Nasdaq Composite Index was down 32.19 points, or 1.26%, at 2,523.14. There were signs that cautious investors were rotating into defensive sectors, with healthcare and consumer staples falling the least. Traders also cited a Wall Street Journal report that the Federal Reserve was keen for US banks to hold more capital than required by US law as weighing on bank shares. “Anything to monkey around with capital requirements will slow down loan growth and slow down earnings, so any sign of tweaking might have an exaggerated effect on trading," said John Norris managing director of wealth management with Oakworth Capital Bank in Birmingham, Alabama. After falling nearly 3% last week, Monday’s losses brought the S&P 500 close to the 1,200 level, cited by traders as an important support level. Losses could accelerate if that level is breached. “That we’re nearing 1,200 is adding a bit of fuel to this fire," Shea said. Investors eyed developments in North Korea after the death of its leader, Kim Jong-il, and as state-controlled media hailed his untested son as the “Great Successor." Adding to worries, Fitch warned on Friday it may downgrade the ratings of France and six other euro zone countries, saying a comprehensive solution to the region’s debt crisis was “technically and politically beyond reach". In company news, Winn-Dixie Stores Inc surged 71% to $9.29 after agreeing to go private in a $560 million all-cash deal with Bi-Lo LLC. More than three-fourths of companies traded on the New York Stock Exchange fell while 76% of Nasdaq-listed issues closed in negative territory.